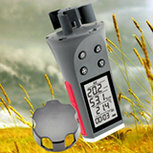 ATMOS Handheld Weather station is designed specifically for the agricultural and scientific markets. 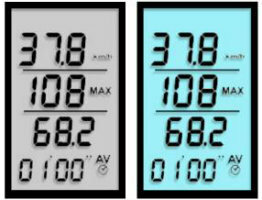 Wind speed, temperature, and relative humidity are measured fast and accurately. Windchill and Dew point are calculated on the Skywatch ATMOS. This unit is by far the best, most sensitive device for measuring wind speed, temperature, and humidity. It is simple to use, accurate, and dependable. Waterproof and unsinkable. 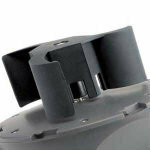 The accurate, user friendly, and multi-functional Skywatch ATMOS, is an asset to Agricultural professionals. Why not make your life easier with the Atmos, instant readings can be taken for all must have parameters so that you can get on with the day job. 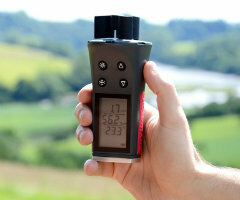 European laws as well as unusual weather patterns make it obligatory for agricultural professionals to measure wind, temperature, and humidity prior to spreading or spraying anything over their fields. Other ideal areas of usage are the Mining & Exploration sector and also the Expedition sector will benefit. The Atmos Skywatch hygrometer never needs calibration, maintaining its high accuracy over the life of the product.Easier to use & handle as the Whirling Psychrometer (Otherwise known as the Whirling Hygrometer)Swiss precision anemometer gives accurate wind speed from ANY direction. 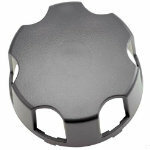 Can be handheld or stand alone. Agriculture: Check weather conditions before spraying to prevent damage to the environment, humans and livestock.